International standards such as ISO14001 also require the compressed air user to comply with local environmental legislation and show use of protective systems and procedures. After the oily condensate has been efficiently removed from the compressed air system it cannot be discharged directly to the foul sewer without first having the oil content reduced to within legal disposal limits. solution. 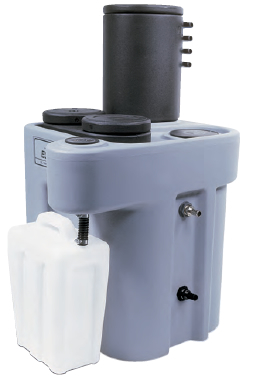 These oil / water separators are installed as part of the compressed air system and simply reduce the oil concentration in the collected condensate to a level permitted for discharge. This allows the larger volume of clean water, up to 99.9% of the total condensate, to be discharged safely into the foul sewer and the relatively small amount of concentrated oil to be disposed of legitimately and economically.